An 80-year-old venue called The Ritz in Yorkshire has been ordered to change its name or face legal action by the owners of the famous London hotel. 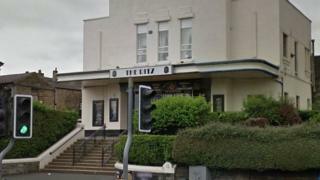 Glenn Smith, who runs The Ritz in Brighouse, received a letter demanding he rename the music venue and surrender a number of internet and social media accounts. The venue has operated under the name since 1937. The Ritz in London declined to comment when approached by the BBC. Mr Smith said he thought the initial email from lawyers acting for the hotel, which opened in 1906, was a scam. But he later realised it was serious when a hard copy of the letter arrived in the post. "Not only do they want us to change the name but they want us to surrender all our domains, our Twitter and our Facebook," he said. "It will completely shut us off from the outside world and make it almost impossible to promote events in the future." He said the venue had worked hard at building an online presence and any change of name could affect its future. "We are working to see how we can get around this but at the moment the future is looking very bleak," he said. "How can we generate income without the events and how can we have the events without generating interest on the internet?" In 2012 a wedding venue in Northamptonshire, called The Ritz, was forced to change its name to the Banqueting & Conference Suites at the Kettering Ritz following a similar request. Owner Kris Malde said: "I feel very sorry for Mr Smith. He's trying to to earn a living. Nobody is going to mistake the Yorkshire Ritz for the one in London."